One of the most common causes of sewer line back-ups, cracked lines and drainage problems is root infiltration. Roots from trees and larger shrubs seek a water source and enter the sewer line from a joint; they grow and expand to fill up the pipe with a hair-like root mass. The masses quickly become clogged with toilet paper, grease, and other debris coming from the home to the main sewer line. As the roots continue to grow, they put pressure on the pipe and it will eventually crack. Diagnosing these sewer and water line problems can be difficult. But not with Micro Plumbing Inc. What Micro Plumbing does is actually camera the inside of the sewer so YOU the customer, can see what is in the sewer pipe obstructing the flow of water or causing the backup. Often time’s repairs are needed immediately but other times clearing roots or debris can be just a maintenance issue. NOT every backup or slow drain means replacement!! Repairing and replacing can be costly. But we will give the customer the power to make an informed decision with the honest truth of what is needed and what it will actually cost before we do the job without an over inflated price!! 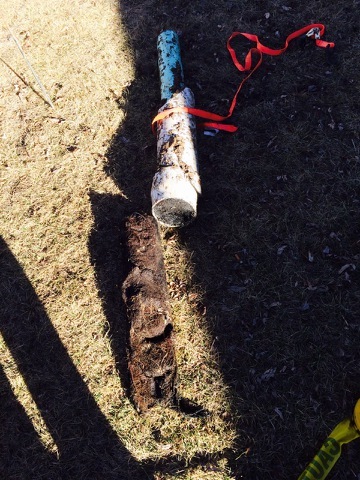 *Picture is showing a section of sewer pipe with root blockage removed.